1. Wash the rice nicely and strain them and keep aside. 2. Take oil in a big pan and heat it. Add onion and fry them till golden brown and remove it. 3. Add cumin seeds, black pepper and laung and let it sputter and then add ginger garlic paste. 4. Add tomotoes and then rest of the masala to it. Add thinly cut potatoes and matar to it. Add some water for masala to cook and potatoes to become soft. 5. Cook this masala till potatoes and matar are almost done and then add water to it. Add ghee during this time. Bring water to boil and cook before adding rice. 6. Add rice and then mix it once so it doesnt break. Let rice soak water into it. 7. Check salt at this time and add if less and add milk along with cut pudina leaves to it. 8. Close the lid and let rice cook on low flame for about 5 minutes till water has evaporated. 9. 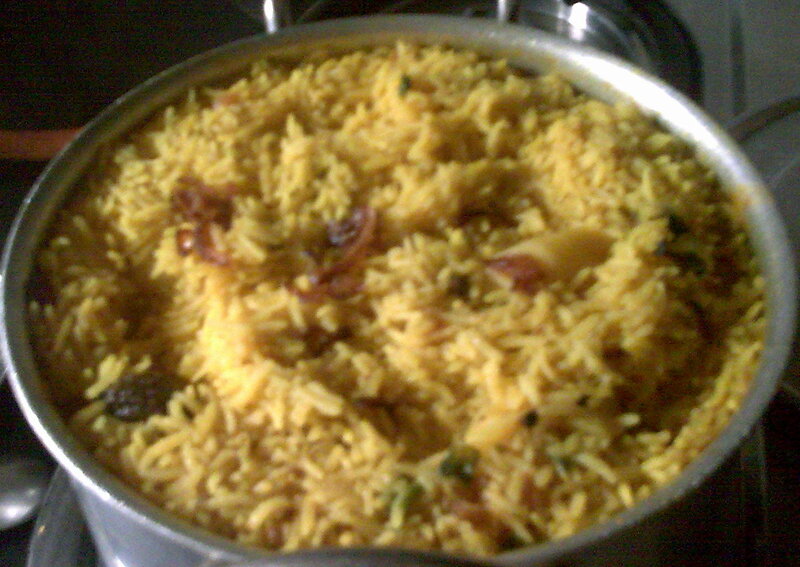 Let the tehri to dum for a minute or two and then sprinkle fried onion on it and mix it before serving. The north indian tehri is ready. Have it with raita, onions and green chutney. Mutter Pulao with Pudina chutney! Sitaphal(Kaddu) Sabji with Plain Parantha!